Installing twin chandeliers over the 12-foot-long handcrafted table provided a necessary visual aid to draw the eye down from the B.C. fir beams. They also created symmetry. 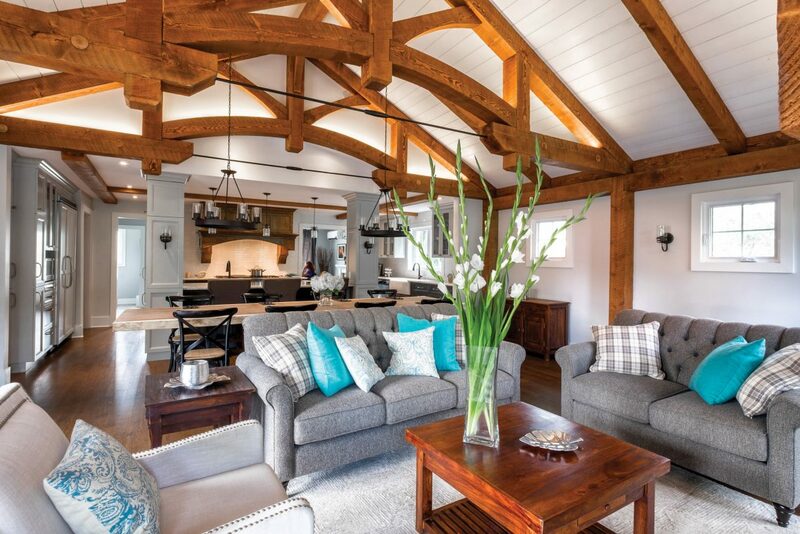 It was a question of balance: How to incorporate heavy timber trusses into a room without overpowering its interior design. 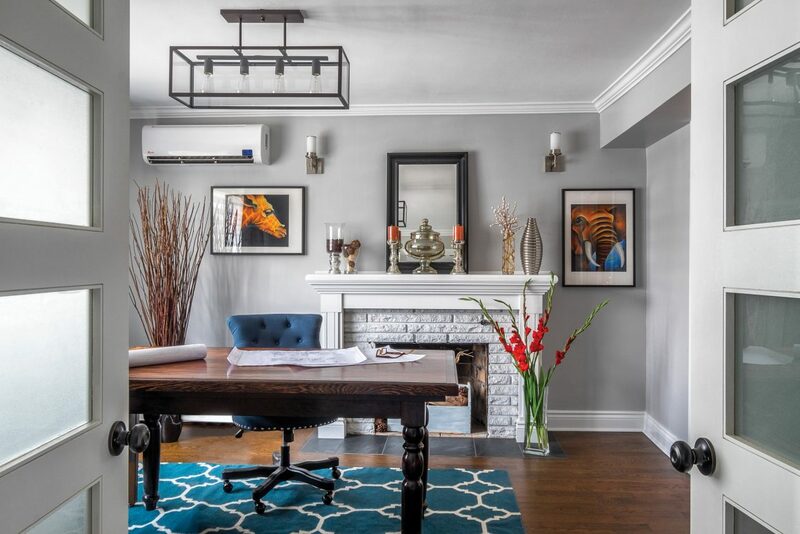 That’s exactly what interior designer Sheryl Johnston of Design Essentials Group achieved in her design of a new great room in Pointe Claire. 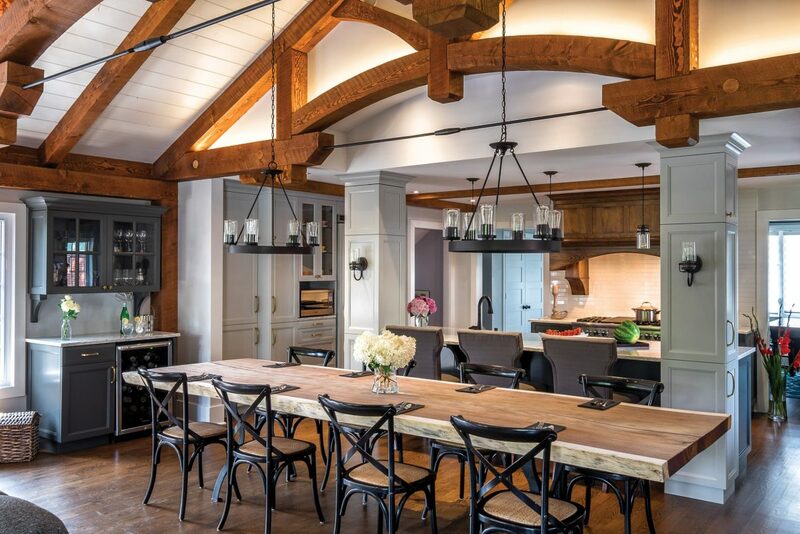 “I looked for ways to keep the eye moving from the overhead trusses to all the other elements – everything from the antiqued pine range hood to the metal-framed chandeliers through to the large fireplace and French doors on the far wall,” says Johnston. The homeowners selected the sofas and chair after speaking with their designer about how many people they planned to seat while entertaining. 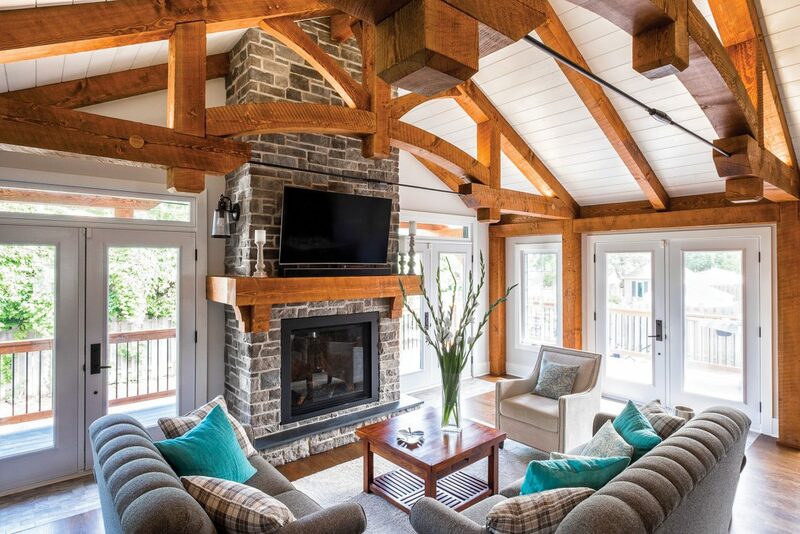 The fabrics lighten the space while the strong traditional lines stand up to the trusses and stone fireplace. A change of cushions easily alters the decor seasonally or for holidays. Homeowners Claire MacDonald and Richard Clement are delighted. “We’re never moving,” Richard says. The couple initially wanted a small extension for a dining room, but Johnston, who’s also a neighbour, showed them how they could expand and transform the ground floor of their 1950s split-level home. Small windows on a side wall allow natural light to enter the space while maintaining privacy. 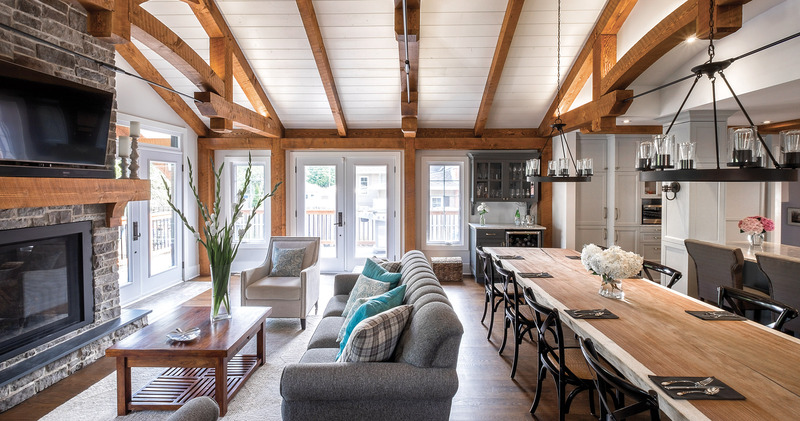 The pine furniture that the homeowners already had also draws the eye down from the overhead trusses. Johnston initially suggested faux beams but, as a woodworking enthusiast, Richard wanted real timber. He did some research and put Johnston in touch with Canadian Timberframes in Parson, B.C. 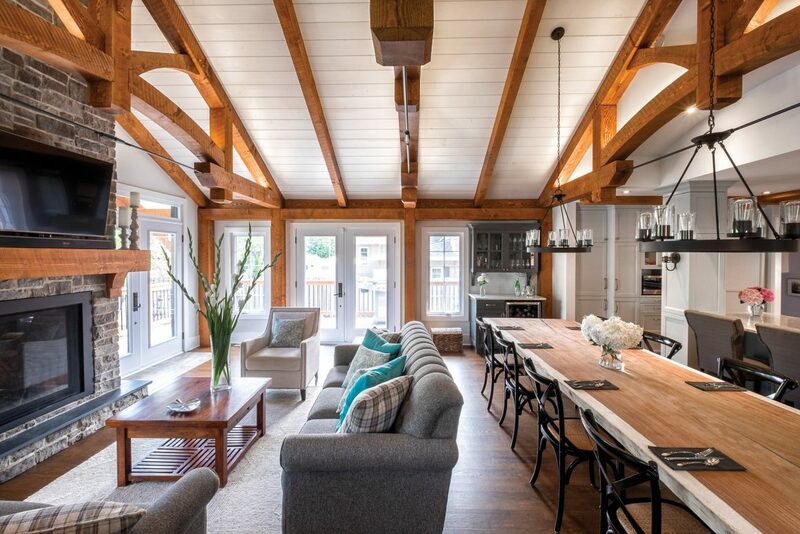 “I couldn’t be happier with the structure and how all of it arrived – including the ceiling and wall panels – on a flatbed truck ready to install,” Richard says. Sales representative David Gagné and designer Garrett Cox worked with Johnston to ensure the framing met Quebec construction specifications and municipal bylaws. “We included steel tension rods to prevent the trusses from moving, even if there’s heavy snow on the roof,” Gagné says. Once the plans were finalized, everything was cut, numbered and stained or painted for Éco-Habitation le Draveur, based in Saint-Hyacinthe, to unload by crane and assemble. “They definitely have the necessary expertise,” Gagné says. 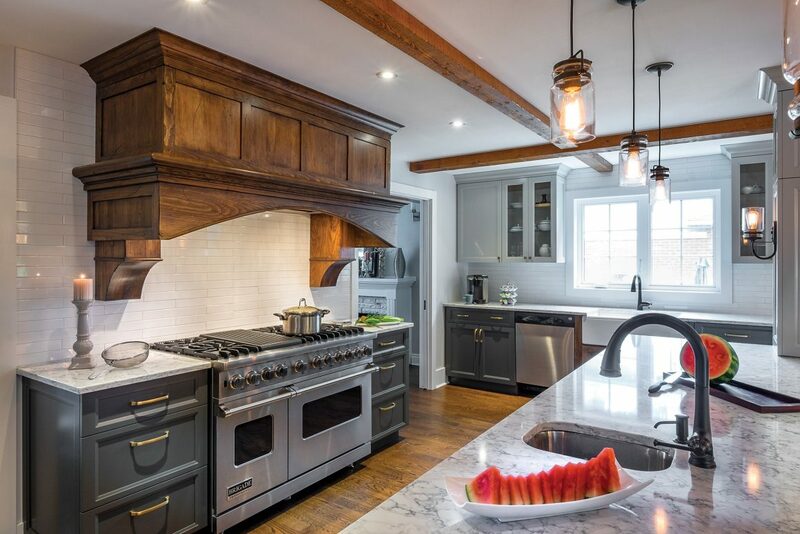 Clear pine was antiqued for the handcrafted oven hood and the wood panelling around the sink to have them marry nicely with the timber framing. Richard praises the yesteryear look that Canadian Timberframes achieved by using an old-fashioned circular saw and wire brushing to bring out more of the fir grain before staining the wood. “Some of the round wooden pegs form structural joints but the other dowels are simply to hide screws and other metal fastenings, so it looks as if it’s all made of wood as it once was,” he adds. 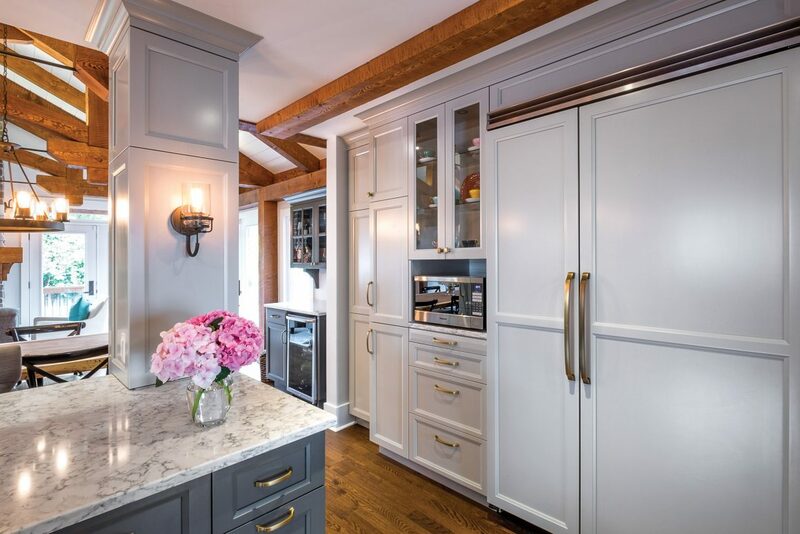 The general contractor panelled the fridge in a frame that included large durable handles, which the family’s young children can pull with ease. The microwave shelf can be pulled out to simplify food preparation. 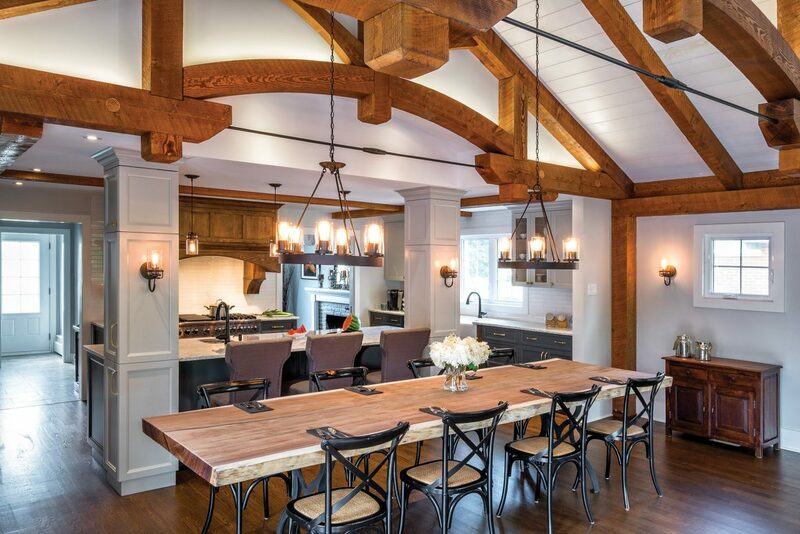 Johnston called upon Cardilli Construction to custom-build everything that wasn’t part of the timber-framing kit. “An excellent mason taught by his father, Marco Cardilli was the ideal person to create the large fireplace,” she says. Advised by Johnston, the homeowners shopped for a gas insert. “She told us to look at the actual flame of each one at the store, which I never would have thought of doing,” Claire says. 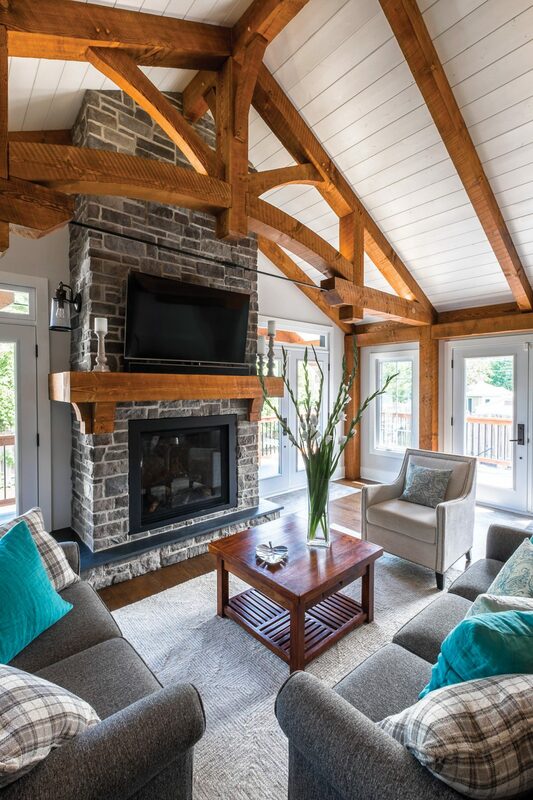 French doors flank the fireplace on each side, welcoming in natural light and fresh air. A third set of doors on a side wall leads to a deck. Plain and plaid cushions pick up on colours of the stone and wood elements while the turquoise adds a playful touch. “Good design always adds unexpected elements,” Johnston says. Another example of that good design is the wood panelling around the kitchen sink that Claire requested. “Once we went with the much larger gas range than we’d ever intended, Sheryl recommended building an oven hood out of wood as well,” Claire says. 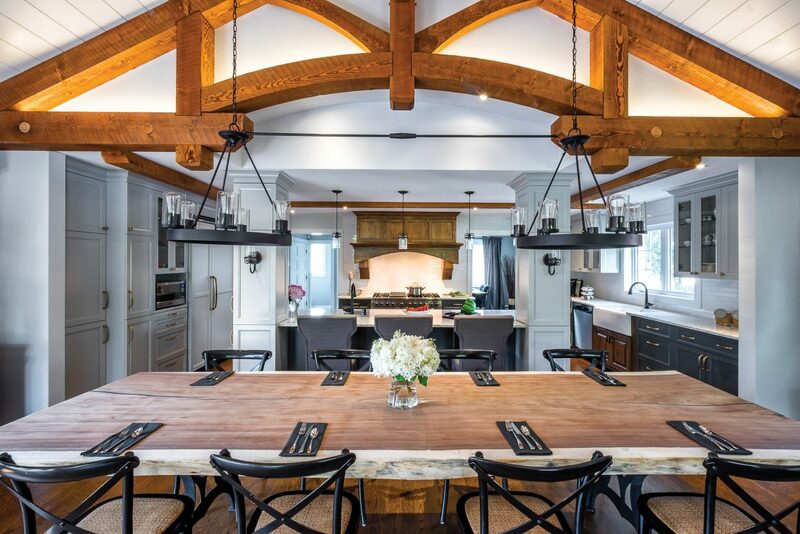 The homeowner made the dining table from a live-edge parota slab that he bought at Courchesne Collections in Laval. 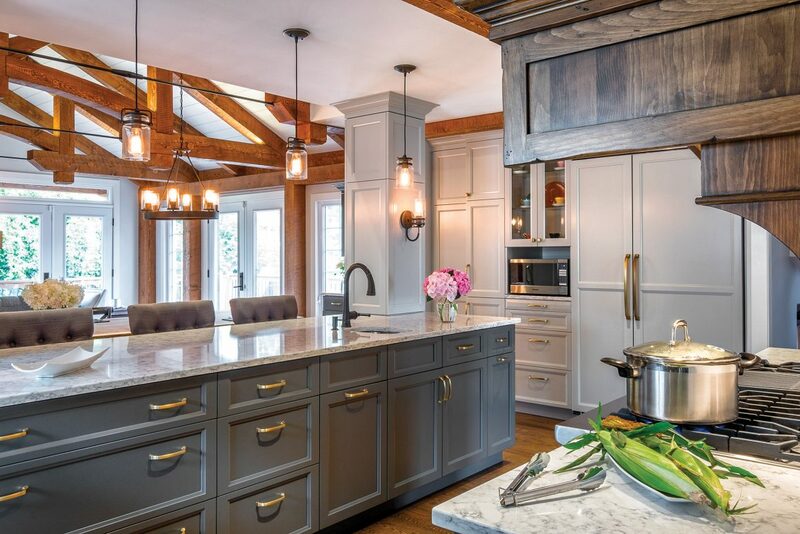 Custom kitchen cabinetry, range hood, fridge and dishwasher panelling, sink cabinet: Ébéniste JYRO; stove: Viking Professional 48” dual-fuel range; lighting fixtures above island and office lighting: Multiluminaire. Metal cross-backs and strappings anchor the chairs along the 12-foot table that Richard fashioned from a slab of parota wood from Costa Rica. It has a cast-iron base that he purchased online. In the kitchen, the upper cabinetry is light grey; the lower is dark grey. The two tones soften the industrial sheen of the appliances. 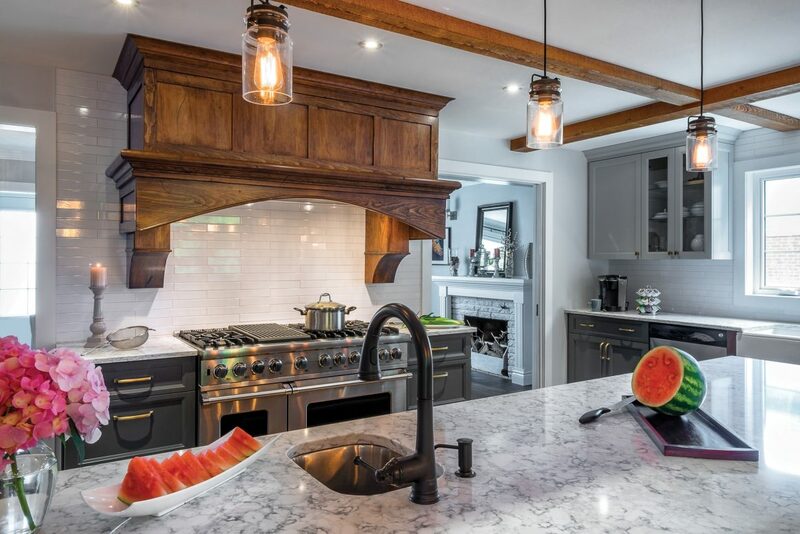 We chose a timeless marble pattern for the quartz countertop to brighten the darker grey island with the same white freshness as the walls,” says Johnston, adding that the Edison bulbs within the open glass pendants cast ambient light with a modern rustic twist.